Our integrated manufacturing and product development model, with a focus on small and medium size OEMs, brings together Box-Build capabilities, PCB Assembly and mechanical services (plastic injection molding, sheet metal fabrication) and engineering under "one roof". An "all inclusive" local partner, shortening the "time-to-market" and lowering costs for electromechanical programs. There is no need for multiple suppliers and for "offshoring". We can make them here in New England. Capacity for low to medium production runs and quick-turn prototypes. ESD compliant. Equipment with capacity reaching 75,000 components per hour, including 10 mil. pitch package placement, ball-grid array (BGA) and in-placement component testing of resistors, capacitors and transistors. 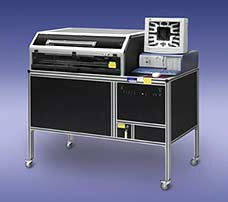 High performance real-time X-ray inspection system, specific for multi-layer, assembled printed circuit boards, with dense metal BGAs. Meet recommended lead-free inspection requirements. Comply with requirements of the RoHS Directive. MPM semi-automatic laser screen printing with precise trapezoidal apertures. 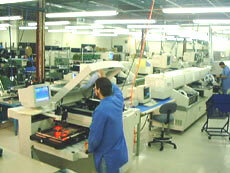 Automated axial / dip insertion lines.